It’s hard to believe, but TWD is coming close to the end of the book! There are two recipes a week from now till the end of the year, but I think I’ll only be able to choose one because I can’t do much baking at home during the work week. This week, I’m making the Far Breton, chosen by Nicole of Cookies on Friday (Jeannette of The Whimsical Cupcake chose Honey Nut Scones as the other recipe). I’ve been intrigued by this one for a long time…just the name sounds so classy. And there are Armagnac-soaked prunes–yum! Falling somewhere between custard and cake, it’s made from a no-brainer batter that gets whizzed up in the blender, crêpe-style. The finished dessert actually reminded me a lot of an unmolded clafoutis. I like eggy desserts, so this was just the ticket. I also like easy desserts that are totally dinner party worthy, and this one fits that bill, too. Next time I’ll add a splash more booze. For the recipe, see Baking: From My Home to Yours by Dorie Greenspan or read Cookies on Friday. And see The Whimsical Cupcake for the Honey Nut Scones. Don’t forget to check out the TWD Blogroll! What an interesting recipe this was. Yours looks perfect! You made a good pick with the Far Breton – it tasted devine, and yours manages to look pretty as well. You’ve seen mine – scary but still delish. I didn’t realize that the prunes were soaked in Armagnac, I’ll definitely have to make this sometime! I’m not big on eggy desserts (I will NOT eat a clafoutis, ick!) but I’m glad that you enjoyed this, as it sounds right up your alley 🙂 Beautiful Far! 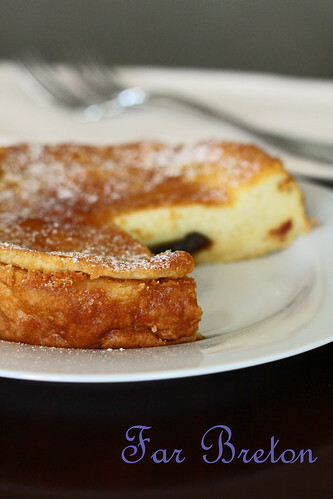 I found this one similar to clafoutis too – I think Breton must be the place to go for custardy dessert lovers! Looks great. oh yes! to dinner-party worthy. Especially since you can’t eat it immediately, so it’d be great for baking earlier in the day and saving for later. And so simple too.